When I was going to school at Baylor I would hang around the bible building a lot. There was a nice tree swing and a bunch of nice little grass patches. There was also a nice little squirrel. One of my favorite things to do was follow this squirrel around. For the record, I kept my distance. I had experienced one too many squirrel fights. I had witnessed one too many squirrels fall out of tree. I had seen nuts flying across the courtyard one too many times. So, I did what I loved. I would watch him bury his nut, then I would go, dig it up and bury it in a new location. My mom said that once the squirrel population became extinct, I would know that I contributed to it. 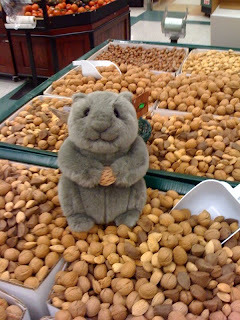 Moving along, there comes a time in every small squirrels life where the dream of swimming in a poll of nuts crosses their mind. Well, although I don't think that what I saw at the store was very sanitary, I must say that this little guy is probably enjoying the most pleasing experience of his life. He has been named. His name is Curtis. Eat away Curtis, eat away. PS! I can't believe he posed and smiled for me! So you must love Hammy. The squirrel by our house is named Rockstar. He actually goes all over... Mabelle and Kricket see him in Kalispell sometimes.